Late last year, several stories were running in the news about various olive oils that were possibly "watered down" with nut oils such as hazelnut oil. For those of us dealing with nut allergies cooking with olive oil, this was terrifying! And especially for parents who are facing new nut allergy diagnoses--many wondered where to turn. I've gotten a fair number of e-mails about olive oil and I've contacted a few companies to get their take on how "pure" their olive oil is. In general, it's best to go with olive oil that is high quality, i.e. often times the more expensive kind. Also, I try to stick with "pure" brands. For example, Trader Joe's sells many types of olive oil that are on the cheaper side, and they have often been repackaged and re-branded for TJ--it's unclear sometimes what is the origin of some of this oil. As much as I love a great olive oil bargain, Trader Joe's has so many nut-containing products that I feel better skipping it. Obviously, you should do what feels right for you. In the meantime, I contacted some olive oil brands found at most supermarkets. To date, I've received two responses, one from Colavita (which I've used for years--it's very good) and one from a Hormel brand called Carapelli. "Colavita guarantees that it does not adulterate its olive oil products with soybean oil, nut oil, pomace oil or any other adulterant. All products are labeled to accurately reflect the actual contents, including the component oils for the canola/olive and soybean/olive blends produced for the foodservice trade. Colavita maintains dedicated processing equipment in its facility to prevent the unintentional commingling of oils, including soybean oil. Colavita does not produce, store or distribute nut-based oil products. The raw material oils that Colavita utilizes to produce its blends are sourced from facilities that may also process other food oils. Colavita requires documented authentication of each raw material purchase. Colavita is committed to high quality and authenticity throughout its product line. These values have been at the core of the company since its inception and will remain so into the future." There is no peanut oil used in the Carapelli products. No olive oil products are on the recent peanut recall. Based on those two responses, I'm sticking with Colavita, for sure. And it tastes better! Also, reputable olive oil distributors value the purity of the oil--it's almost like wine to them in terms of color, taste, freedom from impurities, etc. So you may have to pay a little more, but it's worth it for health and safety. Allergic Girl, Sloane Miller, has some great info on her blog about this story and about her communications with Bertolli olive oil, another good, widely available brand. If anyone has any other olive oil stories to share, please let us know about your experiences. Yes! The food allergy documentary we've been waiting for. I feel like purchasing this for the school, family, everyone we know! I read about this on Food Allergy Buzz and am posting about it here because I want everybody to know about this. Thanks for the tip, Jennifer B! Here is a link to the site about the documentary "I'm Not Nuts: Living with Food Allergies" by Kevin Lindenmuth that is slated to run on PBS stations in May. You can watch a clip on this site, also--just scroll down. I watched it and it nearly had me in tears. Hearing from those who understand how serious this is and who understand that food allergies are NOT a food preference or a food intolerance was a revelation. The documentary interviews parents, kids and top allergists and food allergy advocates. You'll probably recognize some of the names, including Dr. Scott Sicherer, a prominent allergist and author. You can order this DVD on Amazon.com and I suggest you snag a copy for your family and your school! Also, PBS stations will not run this program, free to the public, unless you show your interest! Please contact your local PBS station later today and ask for it by name! Think of all the non-allergic people who can learn from a documentary like this. I've always thought that if more people understood food allergies, they would be more tolerant and accommodating. This is a great way to start getting the message out there! Just heard this news report about the FDA. Lawmakers want to change the structure, separating Food oversight from Drugs. Also, they want to streamline food and drug approval structures and processes. Currently 15 organizations feed into FDA approvals. Ironically, the salmonella outbreak in peanut butter finally got the FDA to sit up and take notice. They weren't all that concerned, until very recently, about people having allergic reactions due to poor food labeling, or unnecessarily limited choices due to "blanket" food labels. But as we know, peanut butter is a huge deal in this country. Finally, they had to take a step back. Whatever it took to get them to make positive changes, I'm for it. Recently, I helped start up a Facebook group with Jennifer B of Food Allergy Buzz called "You Don't Need Nuts to Fly." Along with a lot of other food allergy bloggers and advocates, we were disappointed to learn that Northwest Airlines (recently acquired by Delta) will now be serving peanuts, after years of going "peanut-free." So instead of stewing, we are trying to gain support from people like us who deal with severely nut-allergic individuals in our families. Check out the link to learn more about this Facebook group. We invite you to join the discussion and share your comments. And if you'd like to communicate with Northwest Airlines directly, here's a link. And speaking of Facebook, Jenn of the food allergy blog Rational Jenn just wrote a terrific post outlining exactly what it's like to be the mother of a child with a life-threatening allergy to nuts. She posted the link on her Facebook page today. I couldn't have said it better myself! :) Way to go, Jenn. Recipe of the Month: Nut-Free, Egg-Free, Dairy-Free Chocolate Cake! I neglected to offer a recipe of the month for February and the month is almost over. So here it is, an egg-free, dairy-free, nut-free chocolate cake. I've tried this before and it is delicious, esp. served warm. This cake recipe comes from one of my daughter's "American Girl" books about Molly, the WWII-era American Girl. Due to butter and egg rations during the war, the book offers this recipe for what they call "Wacky Cake." It's named this way because of the unusual way that it's mixed, not because of the ingredients. This would be fun to make with a child, (as I plan to do later today). If you wanted to make the recipe gluten-free, you could substitute non-wheat flours. Any gluten-free readers want to chime in on your preferred wheat-free, nut-free flours? Preheat oven to 350 degrees F. Coat an 8-inch square baking pan with cooking spray. Measure your dry ingredients into the pan and use a whisk to blend them together. Use a spoon to make 1 large crater and 2 small craters in the dry mix. Pour vegetable oil into the large crater. Pour vinegar into one of the small craters. Pour vanilla extract into the other small crater. Pour water into the pan. Using a wooden spoon, gently mix everything together until you can see only a few streaks of flour. Cool the cake completely and dust with confectioner's sugar. If you like, serve it with ice cream, whipped cream, dairy-free whipped topping or other dairy-free extras. Many of you have probably already read about Northwest Airline's new merger with Delta that results in their decision to serve peanuts again on Northwest flights. In a letter quoted in the CNN article linked above, Northwest said that they would serve peanuts since they are backing the peanut industry, represented by Delta, a Georgia-based company. It's kind of like serving cheese on an airline owned by a Wisconsin outfit--let's serve snacks that benefit the home state! I understand the politics of this in theory, but as someone who was happy airlines seemed to be taking peanuts off the snacks list, it's disappointing. All you really get are about 8 peanuts in a airline snack package--why even bother? Clearly the decision was political, not medical and it doesn't look as though this decision was made from a customer service point of view. Previously Northwest didn't serve peanuts; pretzels were their snack of choice. I wonder if the recent peanut allergy backlash has something to do with this decision as well. There's no way of knowing, but it shows that we need to speak up when you fly, now more than ever. Consumers can help change policies, but not if we stay silent. 1. Bring your own snacks. Don't let allergic individuals eat the airline food. Ever. That's the best way to stay safe. 2. Try to take the first flight of the day or as early as possible. Early in the day, the flights are cleaner. Planes are not thoroughly cleaned between flights, but they are overnight. 3. Make your reservation over the phone and speak to a live person; don't book online. You have a better chance of having your allergy needs put in your reservation order if you talk to a rep.
4. Ask to board early, so that you can clean your seating area. A note from your doctor would be helpful here and be polite, but firm. There's no reason they shouldn't accomodate this request; put on your best smile and go for it. 5. Bring something to cover the seat. A beach towel or something like it would be good. This will offer an extra layer of protection from peanut residue. Since it's almost Valentine's Day, it got me thinking about the things we do for love as food allergy parents. Sometimes the things we do are easy, like baking cookies for the class. (OK, sometimes not so easy, I'll grant you.) Or tagging along on our young child's play date, just to be sure they don't have an allergic reaction. Other things aren't so easy. Anyone who's faced opposition about our child's allergies from the school, other parents or even family members can attest to that. It's very hard to single out your child and also single out yourself for what many people perceive as requests for "special treatment." It's very hard at times to explain our child's serious medical condition to other people without either coming across as "Debbie Downer" or as too glib. I find myself walking that tight rope constantly--I don't like to dwell on the negatives, but I have to do everything I can to make the people who care for my daughter understand how to help her stay healthy. Not to get all sappy on you here, but we already have everything we need to get us through the hard times of caring for a child with a severe food allergy. Love for our child is what keeps us going. A parent's love can move mountains. Give your kids a hug and Happy Valentine's Day! Yes, it's classroom party season again which means I've already got cupcakes in the freezer just waiting to be thawed and frosted Thursday night while I watch the Bravo channel. It also means that -- unless we're going to be at the class party -- that it's time to remind the little ones not to eat anything except what Mom sent with them. I only recently found out that, despite the fact I sent home-baked decorated cupcakes for the Halloween party, the Room Moms were offering a Halloween-themed punch that was filled with gummy worms as well as offering other candies to the class. It sounds like a cute concept--except that gummy worms usually have nut allergy warnings. My daughter can't have them for that reason and she (bless her heart) read the gummy worms package herself and then asked one of the moms for a can of "plain" soda, explaining why. I understand that plans change and parents want to use their creativity at a class party. The Room Moms in my daughter's class have been very nice to her and accommodating (and I've gone over the whole allergy thing with the "head" RM), but people aren't thinking about it, which means we need to really be on top of this. I'd suggest getting a list of foods they want to serve (if possible) well before each class party and offering to bring the safe alternatives yourself. Most moms will appreciate the help! My question is: why is there so much food/sweet stuff at school? For example, I'm sending the V-Day cupcakes, but the school is offering small ice cream cups for the entire student body that day. It's a nice idea--a sweet treat from the PTO to the kids. They even sent home a note about this, and asked parents to call so they could offer allergic kids something else. However, with the increase in food allergies, not to mention diabetes and just plain old "health awareness" about too many sweets for kids, I would like to see a lot less food used in celebrations. Our school has taken steps in that direction--no one is allowed to bring in birthday food or pass food around at Halloween, etc. Frankly, I would be fine with that policy even if we didn't have food allergies in our family. Cavities, anyone? If you haven't tried Home Free, you really should. Not only are the foods free of many allergens and made in a dedicated facility, but they're made of whole grains and carry the Whole Grain Council's stamp of approval. Allergy-free and you don't even have to feel guilty about serving them to your kids--what's better than that? Along with organic cookies, you can also find organic coffee cakes, a baking cookbook and allergen-tested baking ingredients at the Home Free web site. 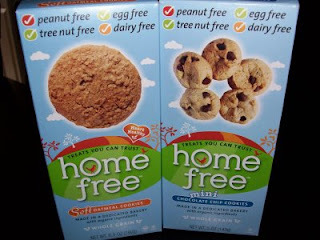 Home Free treats do not contain peanuts, tree nuts, eggs, dairy or wheat. Some products do contain soy lecithin. I know that many of you need dairy-free, nut-free chocolate chips. I tried Home Free's semi-sweet chocolate chips and I honestly couldn't tell that they were allergy-free--they tasted delicious. Also, the Mini Chocolate Chip Cookies (pictured above) disappeared in a flash. My nut-allergic daughter loved them and said they tasted like "Chips Ahoy" to her. Believe me, that's a huge compliment! I loved their crunchy texture and chocolaty taste so much that I gobbled a bunch of them down while writing one day without realizing it! That's one danger of finding an allergy-free source that you really like. The Soft Oatmeal Cookies were wonderful also, as were the Chocolate Brownie Cookies that my daughter brought to school to show off to all of her friends. As my daughter said "It makes me feel good to know that someone has a bakery that's safe for me." I agree 100%! If you'd like to order Home Free treats online or get more information about their product line, visit this link. *Please note: I received no financial reimbursement for this review of Home Free. All the opinions are my own! Here's an interesting link I picked up at Food Allergy Buzz and I'm including it here because the author of the piece asked that it be "passed on." He mentions in his blog post that his peanut- and tree nut-allergic wife has reacted several times at restaurants and catered events. Usually it was from baked items like bread or something "hidden" in a sauce. Even more evidence to "keep it simple" and also avoid most baked items when you eat out with your child! This is a caring post from a loving husband--Check it out! With Valentine's Day just around the corner, I wanted to share with you some great sources of safe treats. Some of you may already know about these; if you don't then I'm happy to be able to introduce you to these sources! Please be aware that some of the sources are only "nut-free" and may contain other allergens. The favorite chocolate treats in our house always arrive from Vermont Nut-Free Chocolate. I "heart" this chocolate seller! As I've found over the years, the more "gourmet" or "fancy" a chocolate product is, the more likely it is to contain nuts. You never have to worry about that at Vermont Nut-Free. Check out their adorable Valentine's chocolates, including hearts, cupids and specially packaged "Skippers" (like an M&M, but nut-free) or heart-shaped chocolate pops. They also now sell sinful chocolate truffles that allergic adults will love to gobble up. My kids love this stuff--the whole family does. It is truly delicious, gourmet-style chocolate. If you have nut allergies in your family, do yourself a favor and check them out. You'll be a customer forever! (Note: they do use egg, dairy and soy). Finally, FAB Snacks has special Valentine's Day treats packages geared towards many food allergies. Check out the site for details! If anyone has any other Valentine-themed treats, let us know! I came across an interesting radio essay today while listening to Chicago Public Radio. You can listen if you click this link or the one above. The author of the piece is an African-American woman who says she recently discovered that she's allergic to gluten, dairy and sugar. It's unclear from her piece, but it did sound as if she is actually "intolerant" and not allergic. Still--with all of the backlash surrounding food allergy and intolerance in the news lately (remember one OpEd piece accusing food allergy sufferers of being only "white," "rich" and "lefty? "), this is a truly interesting piece that explores prejudice against certain medical conditions and how the author feels her race affects her friends and family's perceptions of her disease. See what you think. FAB Snacks...Allergy-Free Treats for You! We've all been there. You go to the grocery store and are frustrated by the lack of "safe" packaged treats you can serve your allergic child. Or you wonder about the packaging label--is a food really safe or is the label accurate? Plus, with all of the class parties and school celebrations many of us have to look forward to, we find ourselves unsure of food to recommend to our class, or to send with our child as an alternative. Jennifer B of the blog Food Allergy Buzz faces all the same problems and so she took action! She decided to start FAB Snacks, a source of allergy-free foods for many different types of food allergies. Q. Why did you start FAB Snacks? 1. I grew weary of going to the supermarket and finding a limited choice of truly peanut free snacks. 2. In my work for Food Allergy Buzz, I was finding that there was a near-monopoly on retailing peanut-free snacks. In addition, I was really disturbed by the markup on the products. While I do make almost everything for my children from scratch, I feel we should be able to buy some snacks that are safe and won't "break the bank". I believe competition is good and will help control the prices on these specialty items. 3. I really want to make these products more easily available to a greater number of people. I know what it's like to go to the store, have my child point out appealing looking snacks, and repeatedly check the package and say "No. This is not safe for you. It's made in a facility that uses peanuts and tree nuts." When you add a dairy allergy, an egg allergy, or another allergy or food intolerance, that problem is magnified even further. It means so much to be able to give your child a safe and tasty snack. Q. How do you determine if foods sold through FAB Snacks are "safe" for a particular allergy? What are your criteria? A. Every item I carry currently is from a facility where peanuts and tree nuts are not present. Also, I am very strict on my definition of "free". The standards I employ with FAB Snacks are the same ones I use with my own children. At FAB Snacks, for example, when I list a food as dairy-free, I mean it does not contain dairy as an ingredient and no dairy products are used in the manufacturing facility. This is based on information I obtain from the manufacturer. As we all know, manufacturers don't necessarily publicize manufacturing changes, so I am confirming the allergen information quarterly, and I strongly recommend customers check it as well. I include a photo of the label showing the ingredient list and other pertinent information for each product on http://www.fabsnacks.com/ so customers can see it for themselves. I am happy to provide whatever information I have received from the manufacturer. Fortunately, allergen information for the snacks I carry can usually be found on the package or on the manufacturer's website. Q. What kinds of foods do you offer? Any favorites? A. At FAB Snacks, we have trail mixes, granola, dried fruits, baking mixes and several other sorts of snack foods. We have snacks that are peanut-free, tree nut-free, dairy-free, egg-free, wheat-free, gluten-free, soy-free, so we are covering the major allergens and will be adding more for each of these groups over the coming weeks and months. It's difficult to pick a favorite snack--they're all tasty! I won't carry a food if I don't like it. My sons' favorites are the granola bars. My favorites are the crunchy dried fruit and sweet corn which has a phenomenal taste and texture--better than any other dried fruit or veggie I've ever had--and the baking mixes. The soycrunch is quite good too; it reminds me of Cracker Jacks! Q. How do you order foods from FAB Snacks? A. I receive most orders online. The url is http://www.fabsnacks.com/. Customers are also welcome to phone directly at 339.788.1059 between 9 am - 7 pm eastern standard time. Many people send an email and tell me which allergies they are dealing with and ask for some tips. The email address is http://us.mc833.mail.yahoo.com/mc/compose?to=info@fabsnacks.com. I've gotten very positive feedback. For most people, it's the first time they've tried any of these snacks, so it's new and kind of exciting.